Interested in becoming a CPS Tech? WARNING: The back seat is the safest place in the event of a crash. Children 12 and under should ride properly restrained in back. The American Academy of Pediatrics (AAP) recommends children remain in a rear-facing child safety seat until 2 years old. When the child has reached the upper height and weight limits of the rear-facing convertible seat, he or she may face forward in a convertible seat or a combination child safety seat/booster. 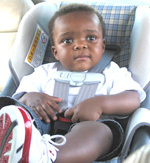 Some forward-facing child safety seats are built into the vehicle seat. A child should ride in a child safety seat with a harness until they reach the upper weight limit, which is typically about 40 to 65 pounds. For children 40 pounds or more who are too young or too active to sit still in a booster seat, or if a vehicle has only lap belts, use child restraints labeled for use over 40 pounds with a harness. The harness straps must be snug and lay on child’s shoulders, not arms. If the harness is even slightly loose, the baby can be thrown out of the seat in a crash. 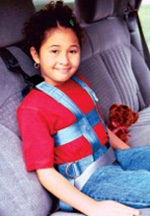 The harness straps must be placed at or above the child’s shoulders in the reinforced slots for the forward-facing positions. Use the very top slots if you are not sure which slots are reinforced. Review the instruction manual for more information. The child safety seat should be in the upright position for the best protection. Review the instruction manual for further information. Do not place any padding, noodles or other objects behind or under the child safety seat. Thick padding must NOT be put under or behind the child. Be sure to place the safety belt or LATCH strap through the correct belt path. 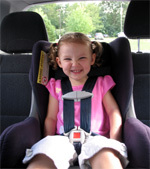 The forward-facing belt path is usually found near the back of the child safety seat. Review the instruction manual for further information. NOTE: ALWAYS read and follow the child safety seat instructions and the vehicle owner’s manual. 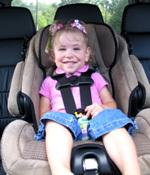 This type of child safety seat can be used either rear-facing or forward-facing. Check the owner’s manual of the seat for height and weight requirements for both seating positions. We recommend a child remain rear facing until 2 years of age and the upper weight limit of the rear facing position. The top of the child’s ears must remain at or below the top of the safety seat back as well. This vest requires use of a tether. The vehicle safety belt goes through loops near the hips. For more information on this vest please click here. This child safety seat comes equipped with a harness and converts from a forward-facing toddler seat to a booster seat once the child outgrows the harness. This can be used as a forward-facing toddler seat when your child is at least age 1 and 20 pounds to about age 4 and 40-65 pounds. Remember: Rear-facing to age 2 is recommended. When your child outgrows the toddler child safety seat, remove the harness and use the seat as a booster. The top of the child’s ears must remain at or below the top of the safety seat back as well. NOTE: Most toddlers and pre-schoolers (up to age 4) are not big enough or old enough for a belt-positioning booster seat. They need a full harness for upper body protection and to hold them in their seats. A full harness should be used as long as possible. Follow the instruction manual on harness weight limits. For children 40 pounds or more, who are too young or too active to sit still in a booster seat, or if a vehicle has lap only safety belts, use child restraints labeled for use over 40 pounds. The back seat is the SAFEST place in the vehicle to install child safety seats.